Rebecca Zung, Esq. and Susan Guthrie Esq. are joined by Author, Gabrielle Hartley, Esq. to discuss the benefits of mindful mediation when going through divorce or other family law matter on Breaking Free: A Modern Divorce Podcast. 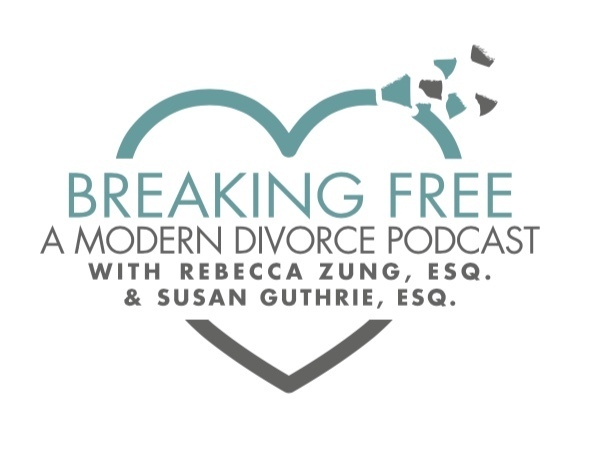 On this very special episode of Breaking Free: A Modern Divorce Podcast, Rebecca and Susan are joined by former guest, and author of “Better Apart: The Radically Positive Way to Separate” Gabrielle Hartley, to discuss the many benefits of mindful mediation. Getting Divorced? Think you have to lawyer up and duke it out in court? There is a better way! Mediation allows you and your spouse to work through the issues together with your mediator and to avoid having some stranger in a black robe make decisions for you! In many states, you can avoid going to court altogether if you mediate your divorce and save immeasurable time, money and stress. Another important consideration is that although divorce can be the craziest time of your life, mindfulness can help you to manage your emotions. During divorce and separation, people commonly are mired in anger, grief, fear and many other difficult emotions as they navigate the process and it is one of the great paradoxes in life that at this time when you are so emotional, you are called upon to make some of the most important decisions of your life. By combining mediation with mindfulness, you can find the emotional space to make those decisions from a rational and thoughtful place. This is the very reason that Rebecca and Susan founded BREAKING FREE MEDIATION, which offers both in person and online mediation services along with a mindfulness track to help you to manage your emotions and to make the right decisions. If you are getting divorced, you need to know your options! Listen to this episode to today! For more information on Gabrielle Hartley and her book, "Better Apart: The Radically Positive Way to Separate" please visit her website at www.GabrielleHartley.com. You can also get your copy of the book on Amazon! For more information about BREAKING FREE MEDIATION, Rebecca and Susan's mediation centers which are the first in the country to offer traditional divorce mediation services along with a mindfulness track, please visit www.breakingfreemediation.com Breaking Free Mediation offers services both in person in Los Angeles, Chicago, Naples and Greenwich (More locations coming soon!) as well as nationwide via an online platform. B.Y.E. DIVORCE RETREATS - as announced on this special episode, REBECCA, SUSAN AND GABRIELLE are partnering to bring you the B.est Y.ou E.ver Divorce Retreats, which will feature inspirational and practical help for women going through divorce as well as those who are still recovering from the process! Many of our podcast guests, including ARIELLE LORRE, JENNIFER GIAMO and TAMMI LEADER FULLER will be featured at the retreats. The first retreat will be held in Los Angeles on Saturday, April 27, 2019! If you are interested REGISTRATION IS NOW OPEN FOR EARLY BIRD PRICING! Visit our website here for more information. For more information from our Sponsor BetterHelp.com Online Counseling, offering convenient and private online access to licensed therapists from the comfort of your own home, visit www.betterhelp.com/breakingfree Listeners of the podcast will receive 10% off on their first month of counseling with discount code "BREAKINGFREE"! Legal Zoom is a resource for forms and documents recommended by Breaking Free: A Modern Divorce Podcast. Go here for more!" "Better Apart: The Radically Positive Way to Separate" by our recent guest GABRIELLE HARTLEY (Episode #123) with Elena Brower, is NOW AVAILABLE FOR PURCHASE!! This book will change how you think about divorce!